On Saturday, December 16, 2017, Cat House volunteers will be at Lincoln Petco stores for Photos with Santa, in partnership with the Petco Foundation. 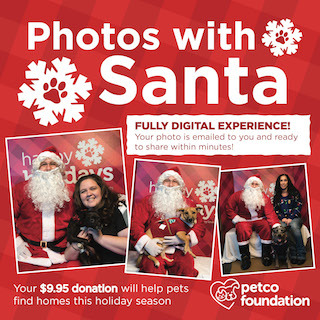 For a $9.95 donation, you will receive an emailed photo of your pet with Santa within minutes. Santa will be at Petco from 1 pm – 4 pm – be sure to visit so you can have your photo taken with #SantaPawsforaCause. Proceeds benefit The Cat House.